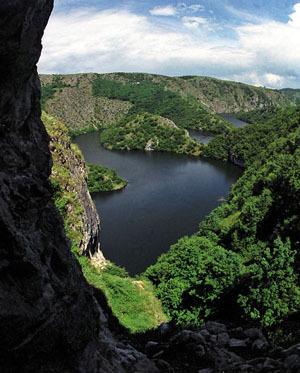 Serbia - the Golden Apple is a book about the prettiest landscapes of Serbia. 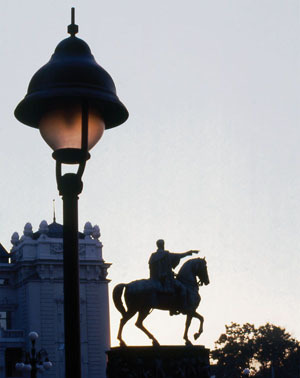 The best photographers took pictures of Serbia. Rivers, mountains, cities, people…this book accompanies them in their search for beauty. And the Creator wasn't frugal here. Serbia – the Golden Apple is a book created in the shadow of Serbian bell towers that rise toward the sky. The prettiest monasteries testify – the “skyward churches of divine beauty”- to the development of the Serbian spiritual vertical line through the centuries. Frescos from their walls are the most beautiful gift of a small nation to the cultural heritage of Europe. Serbia – the Golden Apple is painted with two nuances of gold: the Byzantine gold and the gold of the Baroque. Here the worlds intersected, here the East and West blended. The soul of these people was born in a struggle between the mystical and the rational. The unattainable ambition of this book was to discover the secrets of the Serbian soul that, in one moment smells like basil and in another like gunpowder. 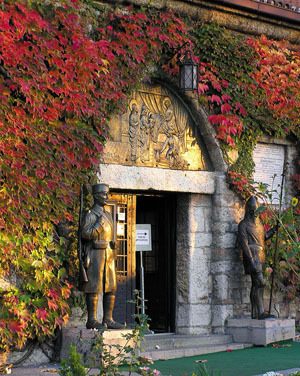 Serbia – the Golden Apple is a book bursting with the past, for this is a land where the past is “longlasting”. This is a book about the persistent survival of beauty and the spirit during difficult times, such as the time one we are living now – but when times weren't yet that hard. Serbia – the Golden Apple is a book about ancestors. It aims to say that this land we walk during our lives isn't actually ours: we inherited this land from our ancestors and we owe it to our descendants. Serbia – the Golden Apple is a story about Serbia. One of the many, countless, possible stories. It starts with Lepenski Vir and ends at Oplenac. Don't ask why it begins there or why it ends there. You know the answer. Even if it began in a different way and if it ended differently, you would still know it. Serbia – the Golden Apple is a book in which stand, next to each other, the paintings of rigid Classicists, wholehearted Romanticists, the Biedermeier salonstyle and the rural landscapes that burst with color and optimism, painted by our naïve artists. Here one can consider which among them correspond to the Serbian soul in the clearest way. Serbia – the Golden Apple is not a book about wars, but about creativity and cultural legacy instead. To some of us, this kind of reassessment of Serbian history is very important. In this book, for example, the “most significant Serbs” are Saint Sava, Nikola Tesla and Ivo Andric. Serbia – the Golden Apple is a book that took nearly two years to write. This is its “hundredth” version. How can we be sure it is better than the first version? Because, when you say “Serbia” everybody thinks of something different. Remember this when you comment on the work of its authors. And don't judge us too severely. Serbia – the Golden Apple was made with love. “A work of love is somehow meaningful and clearly expressed”. We don't know, but God does. 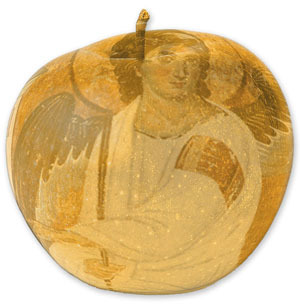 Serbia – the Golden Apple was demanding in its creation and it will be demanding in the reading. Those who don't have hope or faith in Serbia would be better off not even trying to read it. Serbia – the Golden Apple will accomplish its purpose only if, after reading it, you give it to someone who loves Serbia less than you do and who understands it even less – it was created against any haughtiness and prejudice. And there are so many prejudices about Serbia and haughtiness directed toward Serbia. Even in our own country, not to mention abroad. Serbia – the Golden Apple is a project that doesn't end with its completion. Our publishing company is preparing a similar monograph about Serbia today. We are not entering this publishing and editorial work without fear and stage fright. But we will succeed in making part two of the Golden apple. © 2006 Tourist Info Serbia . All rights reserved.